US President Donald Trump has warned Google, Twitter and Facebook they are "treading on troubled territory" amid a row over perceived bias. 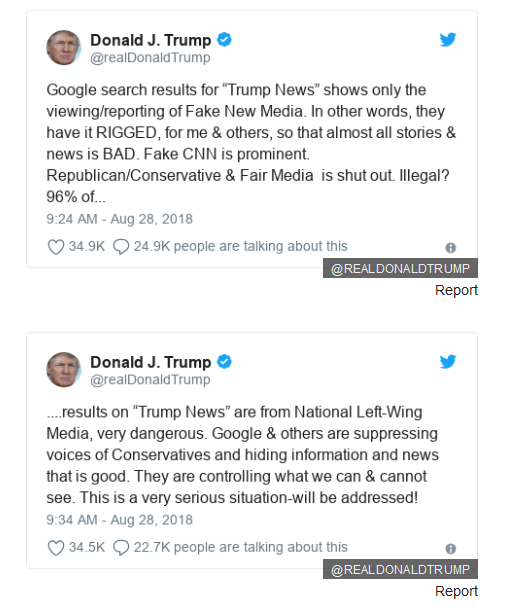 He said they had to be "very careful", after earlier accusing Google of rigging the search results for the phrase "Trump news". An aide said the administration was "looking into" the issue of regulation. 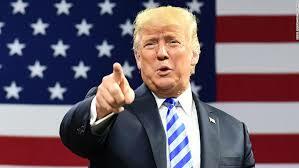 Speaking to reporters at the White House, Mr Trump said Google had "really taken a lot of advantage of a lot of people, it's a very serious thing". Adding the names of Facebook and Twitter, he said: "They better be careful, because you can't do that to people... we have literally thousands of complaints coming in." However, when asked earlier about Google, Mr Trump's top economic adviser, Larry Kudlow, said the administration was "taking a look" at whether it should be regulated and would do "some investigation and some analysis". Analysts say there is little to back up Mr Trump's claim and that it is unclear how he could take action. In an earlier tweet, Mr Trump accused Google of prioritising negative news stories from what he described as the "national left-wing media". He said most of the stories that appeared on the results page were negative and that conservative reporting was being "suppressed". Last week he said social media were "totally discriminating against Republican/Conservative voices" and that he would "not let that happen". It said: "Search is not used to set a political agenda and we don't bias our results toward any political ideology. Mercedes Bunz, a senior lecturer in digital technology at King's College London, told the Media it was highly unlikely that Google was deliberately ranking news according to political bias. "Google's news algorithm is optimised for actuality and proximity of an event but it is generally not optimised to look for political orientation," she said. "However, it has a tendency to rank web pages higher that a lot of people link to. "For news, this does not seem to have changed with Google's last update of its search algorithm, which was rolled out on 1 August." He did not name the source of this figure - but The Verge website reports it appears to have come from analysis by Paula Bolyard at the conservative news site PJ Media. "I performed the search multiple times using different computers - registered to different users - and Google returned similar results," she wrote. "While not scientific, the results suggest a pattern of bias against right-leaning content."